Scott Walker’s re-election as Wisconsin’s governor: Why Republicans think it's the most important Election Day race. Why Republicans think Gov. Scott Walker’s re-election matters most. Wisconsin Gov. Scott Walker speaks as New Jersey Gov. Chris Christie listens during a campaign stop at a GOP field office on Sept. 29, 2014, in Hudson, Wisconsin. EAU CLAIRE, Wisconsin—On a portable stage in the parking lot of a strip mall in front of the Eau Claire GOP field office, sandwiched between a Curves and an Office Products Co. store, Gov. Scott Walker is keeping his chin up. After the beating he’s taken, that’s no small feat. Walker, Wisconsin’s incumbent Republican governor, is in a tough statewide contest for the third time in four years, and this one is much closer than it was supposed to be. The Real Clear Politics polling average has Walker up by just 2.2 percentage points over Democratic nominee Mary Burke, and that number is inflated by a recent Marquette University poll nobody takes seriously that shows him with a seven-point lead. The latest data, from Public Policy Polling, has him up by just one point (well within the margin of error). Given those realities, you might expect a Republican governor to govern coyly. Walker hasn’t. He won the 2010 gubernatorial race by 5.8 points, and in February of 2011 he proposed Act 10 to dramatically curb public sector unions’ collective bargaining power, to bar unions from automatically collecting dues from members’ paychecks, and to demand higher health insurance and pension contributions from government workers, along with a host of other changes. The progressives’ response was immediate—and not particularly subtle. Activists camped out in the Capitol building for weeks, Democratic state lawmakers fled the state to try to prevent a vote on the bill, and national progressives charged conservatives with a “Republican jihad.” None of that worked, and Walker signed the bill on March 11. 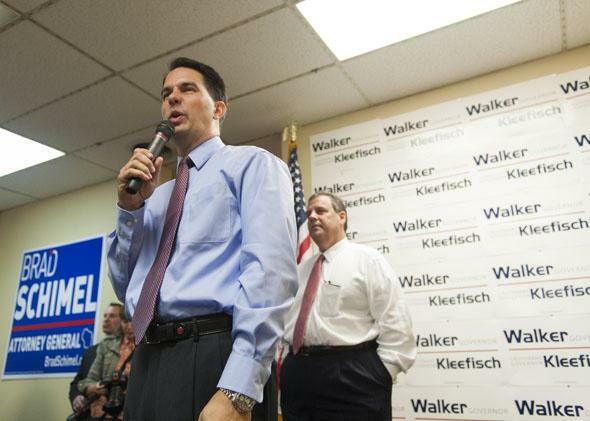 So Walker and his Wisconsin allies have faced an enormous number of brutal electoral battles. But given polling, Tuesday’s gubernatorial race is Democrats’ best shot to get rid of Walker for good. That would be a boon for Wisconsin progressives, of course, but it would also have national repercussions. A Walker loss would send the message to Republican governors across the country that if they take on unions and push for hard-hitting conservative policy overhauls, they will be punished. “If we don’t send Gov. Walker back to Madison, that sends a message to every principled conservative leader that if you stand up for your people, if you grow jobs, if you grow businesses, and you balance your budget, you won’t be rewarded,” said Rep. Sean Duffy, who spoke to a crowd of volunteers in that Eau Claire parking lot a few minutes before appearances from Lt. Gov. Rebecca Kleefisch, Republican National Committee Chairman Reince Priebus, and Walker. “What they don’t like about what we’ve done in Wisconsin is that they’re afraid, come next Tuesday, it might happen elsewhere,” he said. So what’s Tuesday night like for national Republicans if they win the Senate but Walker loses? Talking up the accomplishments of Republican governors is a key part of the RNC’s messaging. Obama is hurting the country, they say, so look to states like Wisconsin and Texas to see how things go when a Republican is in charge. A Walker loss would be a frightening message for Republican governors around the country mulling Wisconsin-esque policy changes. But those fears weren’t on display in Eau Claire this weekend. “Wisconsin is gonna save America!” Duffy yelled as he rallied the crowd in the parking lot. Walker has to get re-elected first.